ROAD TOWN, TORTOLA, BVI, APRIL 28TH 2014 (CUOPM) – The late St. Kitts and Nevis-born legal luminary, Dr. Joseph Samuel Archibald, Q.C. was not only an extraordinary human being, but one revered for his mastery of his craft. Delivering a tribute at Saturday’s funeral service at the Road Town Methodist Church, St. Kitts and Nevis’ Prime Minister the Right Hon. Dr. Denzil L. Douglas, said Dr. Archibald was a profound thinker who never allowed himself to cheapened by shallow, pedestrian notions of success. “Joseph Samuel Archibald was an extraordinary human-being. One did not have to read his resume to know that. One did not even have to know his name. His very bearing spoke of a dignity, a self-mastery, and sense of self that cannot be taught and comes, instead, as a gift from God. He was one of those special human-beings who, from a very early age, filled those who encountered him with a sense which, though hard to define, was nonetheless real – an expectationthings, at the time, undefined…..un-seen and un-seeable…..but which nonetheless caused a stirring of the heart and a quickening of the mind,” he told a large congregation which included Governor Boyd McCleary, Acting Premier, Dr. the Hon. Kedrick Pickering; Anguilla’s Chief Minister, the Hon. 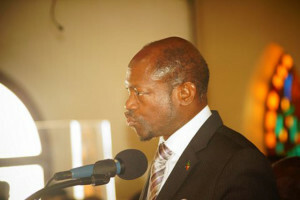 Hubert Hughes; President of the Caribbean Court of Justice, the Right Hon. Sir Dennis Byron; Chief Justice of the Eastern Caribbean Supreme Court, Dame Janice Pereira; Appeal Court and High Court judges, lawyers from across the Caribbean including St. Kitts and Nevis, family members, the Clergy and hundreds of people from all walks of life. He added: “And at neither the early, mid, nor senior stages of his extraordinary life did he disappoint. By dint of the dedication and discipline that were part of his basic character, and fueled by power of his extraordinary mind, Joseph Samuel Archibald moved steadily and deservedly to the very pinnacle of his chosen career. He was revered for his mastery of his craft, and well regarded for his qualities as a man. “Joseph Archibald was all these things – and more. Most of all, he was my friend. A source of faith and encouragement. And mirth, and laughter. A source of wisdom. And love. Yes, Joseph was my friend. I thank him. I honour him,” concluded Prime Minister Douglas, who extended heartfelt sympathy on behalf of the Government and people of St. Kitts and Nevis, to his wife, Mrs. Inez Archibald, Deputy Governor of the Virgin Islands and other relatives.